1. Click the 'Restore Drivers' icon. 2. Select a system restore point in the list, then click 'Next' to restore system. 2. Select the backup record you want restore from the record list, then click 'Next'. 3. 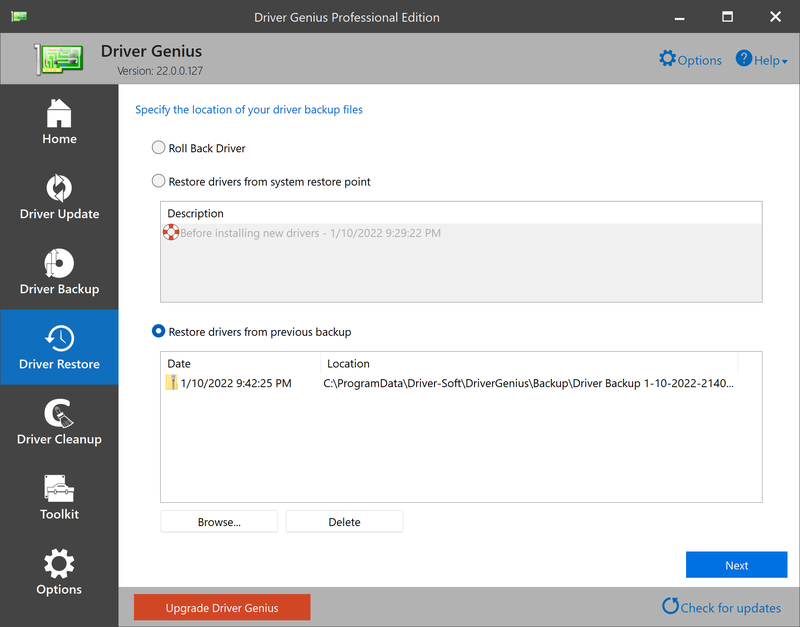 You can also restore drivers from the appointed backup file. Click the 'Browse my computer for backup drivers' button and then select the source type. If your backup type is 'Default', select the 'Folder' option. If your backup type is 'ZIP file', or 'self-extracting file', please select the 'File' option. 4. Click the 'Browse' button to choose the location for the backup file, then click 'Next'. 5. Now your backup files and their details will appear in the list. Select the driver you want to restore and click 'Next' to start restoring. Note: We suggest you close all applications before restoration to avoid conflicts. Do not perform any operations during the restoration process. You will be prompted to restart your computer after restoration is complete. All your drivers will be installed and will then work correctly after the system reboot. If you have backed up your drivers to an auto-installer, all you need to do is launch the .exe file, and select drivers in the list. Then click the 'Start Restore' button to start their installation. You can also perform an unattended installation by using the command line mode. 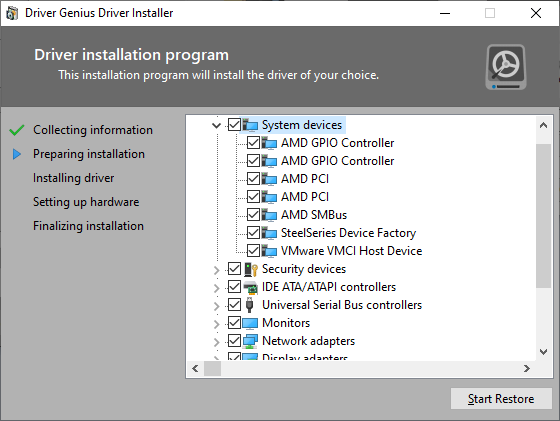 Using Auto-Installer, you can also reinstall drivers on multiple computers that have the same configuration at one time. This is another time-saving feature of Driver Genius. /R : Reboot computer after the installation has completed.